Gmail 4.3 recently hit the streets, bringing with it a long-awaited (by me, at least) ability to archive email directly from the notification panel. It's awesome. But what else did Google sneak into our phones and tablets with this update? Let's find out. Fair warning: this is going to be one of those teardown sessions that raises more questions than answers, so bring your speculation hat. Gmail has always had this wacky file in it called "experimental_preferences.xml." I've mostly ignored it, because it has only ever had two relatively-boring things in it: "full text search," which works already; and "Enable drag and drop contact chip," which would let you type a name into the "To:" field and move it to something like "CC:" by dragging it. See? Boring. "Enable sender contact photos" is a weird "new" feature to add, isn't it? 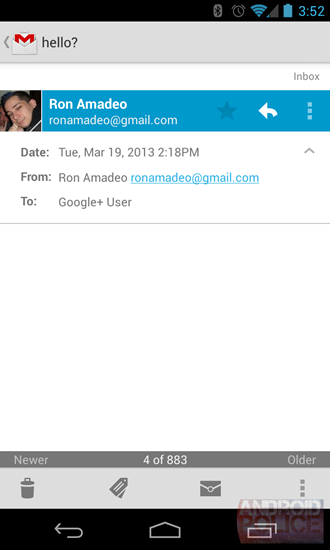 There are already sender photos in Gmail; the person just has to be in your contacts. The summary says it will "Show sender contact photos in conversation list," but that already happens, too. I'm not sure what this is or why it's "Experimental." The only new thing I can imagine them doing with contact photos is pulling down public Google+ profile pictures for people that aren't in your contacts. There is no evidence that this is in any way related to G+, though, so I'm stumped. "Enable single-message zoom" - actually, I'm going to call it by its much cooler internal name, "enable-whoosh-zoom" - is another head scratcher. The summary says it will "Zoom into individual messages using a single-message view." Is a "single-message view" an alternative to the normal, threaded view? Your guess is as good as mine. Something that "whooshes" sounds fun though. I want my email to whoosh. Now, clearly, this is Google Maps stuff. My only theory is that maybe the aforementioned experimental "whoosh zoom" feature needed some fancy gesture or graphics effect that was already in Google Maps, and someone got a little overzealous with the copy/paste button and accidentally brought along the "mapType" stuff. It must be an accident, I can't think of a single legitimate reason for Gmail to have a satellite view. The rest of the items, camera zoom, tilt, and a bunch of gestures, are possibly justifiable things for whoosh zoom. The biggest new feature of Gmail 4.3 is the notification actions. Currently you can archive (or delete) and reply directly from the notification. Swapping out archive for delete is a currently pretty unintuitive; it chooses whatever you've picked for your swipe preferences. Hmm... There's some very interesting stuff going on here. 1) The number of notifications is a variable (%1$d) suggesting that it could, at some point, be more than "two." and 2) "Select"? You'd be selecting from 3 options. There are actually 10 notification actions in the strings file, not 3. There is everything you could want here, and along with the preferences, a decent sounding method for selecting them. The only question is, is this an upcoming feature, or a scrapped one? My Google+ profile address is http://plus.google.com/104025431341062052230/; we'll call the big, long number my Google+ ID. Take the "veiled address" string, "reply-[0-9][email protected]" and replace "[0-9]+" with my G+ ID, and you'll get "[email protected]." 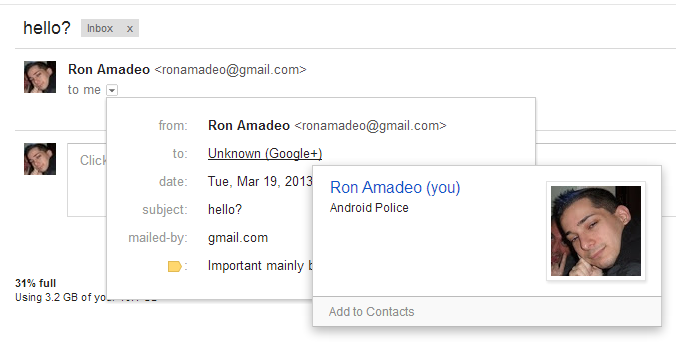 Main page simply says "to me," keep in mind I actually emailed [email protected], yet Gmail recognizes this as "me". If you click the down arrow, it says "To: Unknown (Google+)." Mousing over it will show my G+ contact card, and clicking on it will load my G+ profile. Crazy. If you try to email someone else with the "reply-[G+ID]@profiles.google.com" method, Gmail will even suggest that you add that person to your Circles. It says "To: Google+ User," so I'm pretty sure I've triggered the string "<string name="veiled_alternate_text_unknown_person">Google+ User</string>." Right now, you can only email yourself with this method. If you try to email someone else's Google+ ID, the email won't bounce, but it will never get delivered. I tried email other members of AP and no one received anything. I guess the messages just hang out on Google's servers in some kind of email purgatory. This makes me think this is a future feature of some kind, but, because it hasn't launched, no one has any privacy options set yet, so emails to other G+ accounts are blocked. Emailing yourself works, because you would never need a privacy option to block yourself. It's also important to mention that this is not the same thing as the "email this user" button that is currently on Google+ profiles. That's just a web form, the headers are totally different, and none of the address replacement stuff happens when you use that. So. I've figured what this does; I just have no idea why it exists. Is there anything out that there in Google land uses an email like "[email protected]"? Why does it say "reply?" Reply to what? If you drop the "reply-" and just email "[email protected]," delivery fails and none of this works. Why would you add special logic to your email app to swap out the "To:" field with information from Google+ for one specific style of email address? Is Google just pushing G+ integration really hard, and they're going to start matching email addresses against Google+, like some sort of super address book? Will Gmail one day display "+Ron Amadeo" instead of my email address? Is this some part of the fabled unified messenger?